AND fusing group pyschology into the ONENESS experience.. Truly this IS the GRAVITY of our situation - "keeping it together" : Get fractal (centripetal) or get dead! - SEE ALSO BELOW AMAZING NEW SEED GERMINATION EFFECT TIME LAPSE- FROM THEIMPLODER Tech. How to be the (Golden Ratio/Fractal/Conjugate) LIGHT of the WORLD! As scientists we predict- if our technology culture does not actively learn the single symmetry principle of how centripetal forces are created and sustained - WE WILL NOT SURVIVE THE NEXT FEW DECADES. All self organizing systems- from gaia's plasma body to the only real definition of peacemaking- require this. To FOLLOW THE LIGHT - you follow the fractal path where living plasma/charge compression and spin density- is made possible by the symmetry which allows efficient charge distribution. When we said God is the truth and the light- what we meant was that the living (plasma/charge/ether/spirit) fountain of ancestral memory and the collective conscious existed in the fractal places and times where the lightening heart of spin enabled perfect wave connectivity. When you have bliss- it feels vividly like a flame around your pineal.. and your heart! The conditions to invite it are full of science lessons- mostly having to do with- how to join a perfectly shareable wave... call it Christos because this implosive compression IS precipitation! Fractal THOUGHT: Thinking or perception itself IS a centripetal force! The reason you cannot think straight- may be in your environment. Failure to conjugate and compress- is loss of life and mind!. Certain frequencies allow field effects to initiate implosive (self organizing) compression. Others prevent that from happening. A weak field- which has the right harmonics and symmetry actually CREATES human attention AND seed growth! Examples: The 'Stonehenge' effect on seeds - book: Seed of Knowledge. Also the Vairocana / Kiva / Hypogeum effect to create initiation and life extension- how the SHEM or altar stone WAS the capacitor of life. (films at goldenmean.info/malta ) This is how the KABBA stone is a bliss field. You can demonstrate this to yourself very easily. Put your head a bit too close to a noisy refrigerator- or to most any noisy source of serious electro-smog ( 3 or more transformers powering too many of your computer toys). What happens? You notice- that "you can't think straight". IF the frequencies and symmetry of the field prevents compression- then life and mind and gravity are reduced. The old story- the day you replace the bad flourescent light with sunlight in your childs classroom- is the day you measure the RETURN OF ATTENTION SPAN. WHAT IS THE NATURE OF ATTENION? Perhaps here we have a clue. Let me tell you a short story based on my 30 years or more as a seminar presenter. We once did an intense 3 day or so conference near Geneva- in a beautiful chalet overlooking lake Geneva. Not only did I have my usual computer, projector and disk power transformers, but also Valerie and wonderful Cedric Mannu- doing French translation had their computers plugged in - near the front of the beautiful room. Somewhere around the second day, Karen- (deserves credit for this) - pointed out that she was feeling disoriented and getting bad digestion- everytime she was anywhere near the front of the room. Having sensed the nauseating problem of these - at least FIVE transformers plugged in - I decided to try a simple experiment. I unplugged all of them at once- and there was a gasp- of relief. Sudden and dramatic. The intense nausea and dizziness that was gripping the room - suddenly relaxed into a dramatic peacefulness. Before that- nausea and indigestion - and shortness of attention span- was quite evident. Now, this is not a new observation. Scientists can easily measure how the wrong frequencies in your light and your electrosmog- reduce attention span ("Health and Light" by John Ott, and other works). What IS new is to explain why and how. Attention itself is the process of gathering charge (or plasma or chi) into the symmetry necessary to imploder and compress. Digestion itself - is a process of gather charge into implosion. For example- notice that if you remove synethetic and / or restrictive clothing - and then put your feet into (onto) living water and or rock- suddenly you burp or fart and digestion gets going! The electrical process that is digestion IS implosive compression- and that requires coherent phase relationship with ground - which IS a fractal frequency signature. (as Russell- so helpfully pointed out- you need to read about the health aspects of EARTHING- see EARTHING.com - and read the book). How a particular musical signature- and therefore symmetry of field, is the key to staying alive and centripetal- is the alchemic heart of this article. They failed to understand that their Josephson Junction kind of transducer (in the Random Number Generator) is in essence the same capacitive coupling as the "Callahan Probe" tree capacitive I originally showed them. If you don't understand that mindfulness- is the generation of the symmetry of implosive field compression- and that has a specific symmetry and frequency- then- you cannot very well measure when the conditions for self-organization are fulfilled! that only one particular frequency signature will make a field centripetal and therefore self-organizing / mindful / alive. -- It's a pity that even though one of Heart Math's allies - Bill Tiller- pioneered some of the most careful measurements that FOCUSED ATTENTION CAUSES FIELDS TO COMPRESS (book: "Conscious Acts of Creation")- he joins them in refusing to understand what is the electric field shape which causes that to happen. SO- this is the alchemy of our moment now. We need to actively understand, teach, and create the conditions for our environment to restore compression- and therefore emerge from chaos. Dan Winter's best Aussie 2010 Lecture-Byron Bay:- NOW in FULL RESOLUTION ONLINE..
News from the SuperImploder Project: Amazing new time lapse photo - conclusive evidence of growth effect! The plants are beefsteak tomato plants. 32 seeds total. Started on 9/11/11, completed on 10/21/11. 41 days total. More Detail: The Left Front is SuperImploder treated water effect-note the growth difference! Sacramento, California - Neil W. letter Nov 8, 2011: (quote)- Salutations Dan, I hope this email finds you well. I wanted to thank you again for agreeing to the discount on the Super Imploder and give you an update on my findings so far. 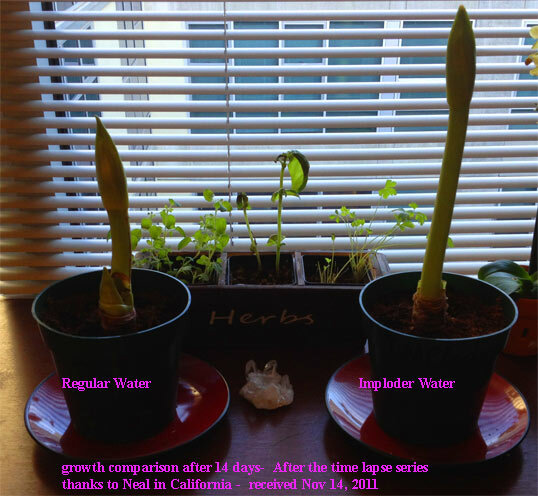 I bought two identical plant packages and used the imploder water on one and tap water in the other. The first thing noticed was that the imploder water absorbed the soil in about 1-2 minutes, leaving the soil looking moist & fluffy and the tap water absorbed the soil after about 30 minutes. Even after 40 minutes the tap water Was not completely absorbed and made the soil into a sloshy mud. Both plants are placed in the same soil, same sized pot and in place in the same sunlight. The only difference between the two is the water. Day 1) Tap : no significant change in growth. Looking a bit more brown. Imploder: immediate noticeable growth of 1/4" - 1/2". Plant is noticeably greener , straighter and has a new patch of red on the stock. Day 3) Tap: growth of 1/4-1/2". still has some brown color. Imploder: growth Of 1". Vibrant green color. Today Day 7) Tap: growth of 1". Slightly greener but still has some brown coloring , new red patch on stock, growth of two new stocks sprouting On the base. Imploder: growth of 2.5". Two new stocks spouting from base. Bright green and much straighter than the other. So far the the plant with the imploder water has double the growth compared to the tap water plant. Very impressive ! New- Neal added up to day 14- look at the difference in the update pic below! Bath: In the bath the water has a "silky" feel to it very similar to how conditioned "soft water" feels. Soap, shampoos and hair conditioners are more effective and skin is noticeably softer. The imploded water also does not bead up on the skin like tap water and appears to be absorbed more efficiently by the skin. Drinking : The smell of chlorine is removed and tastes much better. It's almost as if your body is saying"Yep... That's the stuff I like". Tea and coffee Taste much much better. The flavor of the tea comes through the water and you can even taste the individual favors if each type of leaf but the coffee is what really blew me away. The coffee tastes much smoother and much less acidic. Honestly I would recommend that someone purchase an imploder if it was only for this one reason ......tasting The worlds best coffee. Another thing that I do not know how to document but thought it is definitely worth mentioning is that after drinking the imploder Water the first night, I felt like I had much more energy and I woke up much earlier than normal because I had so much energy. Even with less sleep I felt more awake and clear headed the next day. Just looking at the difference in the two plants really makes me wonder what a huge beneficial difference it would have on humans. electrical geometry of how ELECTROMAGNETISM becomes GRAVITY. the blood) is really DOING - in electrical terms. SELF SIMILARITY is the ELECTRICAL CAUSE OF GRAVITY!. about the GRAIL (and gravity making) in blood. icosa infinitely- an ancient Theosophic model called the GREATER MAZE. Later Winter claimed this was THE ONLY POSSIBLE 3 DIMENSIONAL FRACTAL. (Elizabeth Rauscher, Alex K..)- have taken on the challenge. fractal - may be the actual KEY to physics HOLY GRAIL! leading fusion physicists) have joined him. solution to the ancient quest for the bloodline of Jesus?? one that (being fractal) never runs over - contains infinite SPIN. charge absorbing 'Golden Fleece' in DNA ( www.goldenmean.info/rein ). out - is simply equivalent to perfect COMPRESSION ). / shakti ) - into perfect compression - called LIFE ITSELF! capacitors which make gravity ( goldenmean.info/thrust ). the history part of this problem. Is this the SIEGE PERILOUS part? church?? Here is where we need Star Wars... or rather the BIG picture. radio by phase conjugation) in the electric field of their core. Sacred geometry was preserved throughout history in Freemasonry circles since it was believed to be important knowledge revealing the secrets of our universe! Contemporary scientists now tell us that in fact all of creation is the offspring of ether vibrations just like the Eastern Hindu cosmology has always talked about the Ohm sound of Brahman as the vibration that creates the physical world. The experiments of Cymatics are now interpreted by Daniel Winter and David Wilcock to show us how the Platonic Solid interference patterns also occur within the ether and that it is these interference patterns what really shapes the atom. The Egyptians called matter frozen music and if indeed matter is the result of musical vibrations of the ether just like the cymatics experiments demonstrate, we can now appreciate why. Daniel Winter presents a physics model called ‘Phi Physics’. He concludes that the entire universe, the material world is created from one non-material substance, the ether. The ether is a kind of super conductive fluid that flows right through all physical objects. The ether vacuum is an extremely dense nonetheless frictionless medium. The best comparison for the ether being it non-material in nature is the super conductive state of helium. When helium is cooled down to temperatures below 2 degrees Kelvin it becomes a super fluid, which means that objects can move through this fluid with no friction at all. Daniel Winter now believes that vortexes, little eddies or tornados in the fluid-like ether are the basic building blocks of matter. Since the ether is some kind of a fluid, it follows the well-known physical laws of hydrodynamics. They called these torus like flow forms the ‘Anu’ and mentioned that the atom is shaped from the ether using the Anu as a flow form. According to Daniel Winter the ether creates vortexes, little tornados of whirling and spiraling energy in the ocean of ether, our universe. The vortexes in the ether are like the little eddies in a river. The vortex is nature’s natural flow form for fluids. 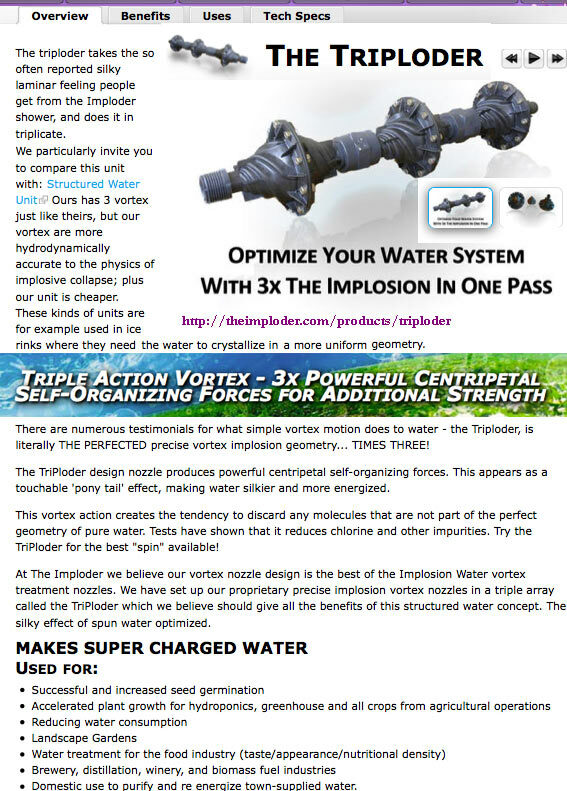 The same vortex flow form is created every time we pull the plug in our bathtub! If the universe is essentially created from one universal substance, the ether, it must be form that is used to create different and separate things out of this universal energy. The torus is nature’s perfect flow form to create a seemingly separate entity in the formless ether that is stable enough to last. The individual ether torus doughnuts can be nested inside each other. Nesting torus doughnuts requires that the vortex cones of the torus are aligned with the faces of the Platonic solids. The nesting of the Platonic solids is not restricted to the cube and octahedron. All Platonic solids can be nested into each other. It is the nesting of the Platonic solids what creates the electron shells of the atom. Similarly however at a much smaller scale the nucleus of the atom is formed. So matter is the stable flow form pattern emerging from the ether. It takes on geometrical shapes from a formless energy, creating the illusion of separate electron particles in the electron shells and the particles that make up the nucleus. Mainstream physics has never been able to explain why the atom has these ‘random’ numbers of 2, 6, 10 and 14 electrons in its electron clouds, the orbital shells around the nucleus. Daniel Winter’s model of the atom now explains exactly why these number show up in the period table of the elements! These numbers are related to the geometrical properties of the Platonic Solids! Also for the very first time we have an explanation as to why the electron does not crash into the nucleus and how it’s radiated energy is replenished. Electrons are not particles that encircle the nucleus in stead they are standing wave patterns at discrete distances from the nucleus! The ether simply replenishes eternally these standing waves. When pure sine waves with wavelengths of the above frequencies are added together, they will form a perfect Phi spiral. When these Phi spirals circle around the torus they meet and interfere. As a result of this interference two new additional waves will be created. What is important to notice is that both new waves will have wavelengths that are again in the Fibonacci series. This makes that the interference will be non-destructively since the interference will simply result into more harmonics in the Fibonacci series. Whereas destructive interference is the norm in wave interference; the only exception in nature is when the waves interfere with Golden Mean ratio wavelengths! In other words, the Phi spiral can re-enter itself around the torus shape without destroying itself. So the Phi spiral is the universe’s only possible way to nest and become self-organizing. This is how stable matter can be formed from electromagnetic energy as a form of pure wave interference. Electromagnetic energy in a straight line is what we usually call light. When this same light chases its own tail around the surface of the torus shape we call it matter. In other words the atom is pure bended electromagnetic energy that we no longer perceive as light but as matter, or to put it in Daniel Winter’s own words; ‘So now we have this dualism that waves in a line are energy and waves in a circle are mass, and because we don’t know how the wave got into a circle from the line and out, we conceive mass as separate from energy. E=MC^2 simply said that yes loop the speed of light back around on itself, and you made mass of energy’. The Golden Mean spirals of the torus shape eventually spiral into a perfect zero still point in the nucleus of the vortex that coincides with the nucleus of the atom. So these sine waves implode inwards into increasing smaller wavelengths. The implosion of the Golden sine waves into smaller and smaller wavelengths not only increases the frequency of the waves but also increases the speed of the waves to become super-luminal waves (traveling faster than light). According to Daniel Winter, this is what gravity really is, the cascade of Golden Mean electromagnetic sine waves that gain an ever-increasing velocity breaking the speed barrier of light. 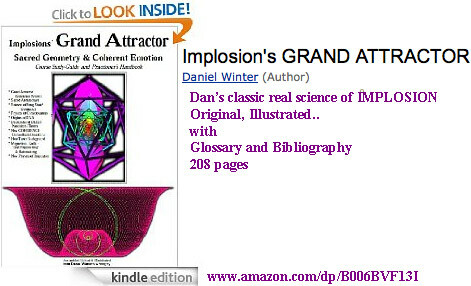 Einstein had always assumed that electromagnetism and gravity were related and Daniel Winter explains us how this connection is established. The repetitive patterns of the Platonic solids that fit into each other form fractals. A fractal is a repetitive pattern that can be scaled to any size. The scale may change but the ratio is held constant. A fractal has self-similarity at all scales, it’s the same geometric pattern repeated. The inner structure in a fractal is reflected in the outer structure. Fractal means fraction of the all, indicating that each piece is part of the whole. It is the basic idea of a hologram and this is why according to Daniel Winter the universe at large is just a super hologram. The fractals of electromagnetic energy interconnect everything with everything and are the basic building blocks of this hologram. The fractal repetitive structures of electromagnetic energy weave a giant cobweb throughout the universe. The wavelengths of planets and stars are huge in comparison with the wavelengths of the atom, however when their wavelengths fit into the Fibonacci sequence of the Golden Mean, they interfere non-destructively, they implode and form a fractal attractor that we call gravity! This is how the planets and stars are connected by means of imploding electromagnetic waves that we notice as gravity. So if the universe is in essence a hologram and there is only one principle that shapes everything from atoms to planets stars and the universe at large, we should find proof of these Platonic Solid and doughnut structures in all parts of the universe. This holographic principle of the universe was first mentioned by the ancient Greek Hermes Trismegistus and written down in his emerald tablets as one of the seven Hermetic principles ‘As above, so below, as below, so above’. What Hermes meant was that there is a correspondence between the different planes of existence, the macro-cosmos and the micro-cosmos. This Hermetic principle tells us that what we see out there in the universe, in the galaxies, stars and planets, we should also find on a smaller scale inside the atoms. Surprisingly enough, NASA in the summer of 2004 released new information about discoveries that were made with the European Space Agency observatories the INTEGRAL and XMM-Newton. They discovered that so-called black holes in our universe are actually doughnut shaped torus formations! Black holes are objects that exist in our universe with an unfathomable mass. They have the density of millions to billions times the mass of our Sun and the gravitational force of black holes is so strong that nothing can escape from it, not even light. 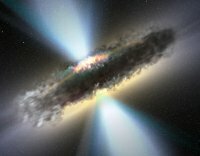 Everything in the environment of a black hole is attracted to the core of the black hole. There are now a number of astrophysics theorists who have launched the idea that the universe at large has the shape of a giant doughnut torus. One of these theorists is Professor Joseph Silk of the Department of Physics, Oxford University. The most common used method by scientists to model the shape of the universe is to measure and determine the geometry of the cosmic microwave background radiation of the universe, the primordial residual energy of the Big Bang that created the universe and it is from these measurements that these new ideas of the universe stem. If we assume that the universe is indeed in a perpetual cycle of birth and dead then the doughnut torus shape can perfectly explain and model this behavior. Just suppose that all planets, stars and galaxies move through space in this huge doughnut shaped universe. The center of the doughnut represents the moment of the Big Bang. The center like the center of the black hole is a singularity where all space and time are infinitely compressed. Think of this zero point as the eternal now. Now when we leave the zero point of the doughnut and move outwards through the funnel over the surface of the doughnut, space emerges and starts to expand, time starts ticking. We’ve left the ‘white hole’ of the universe where planets, stars and galaxies are birthed. While traversing over the surface of the torus, space keeps expanding until we cross the equator, the middle plane of the symmetrical torus. Next space starts to shrink again and all space is attracted to the ‘black hole’ opposite pole of the doughnut where everything will collapse again to the zero still point within the doughnut. We’ve completed one complete cycle of birth and dead! The eternal cycle of the universe would be such that everything is being birthed from a singularity, (The Big Bang), the white hole of the universe. After the universe’s birth we move for billions of years through space to end up where we started to be attracted again into a huge black hole. From there on the next cycle is started. Richard Hoagland together with David Wilcock have pointed out that there are planets in our Solar System that show geological stress points at exactly 19.47 degrees latitude. Examples are the Great Red Spot on Jupiter, the Great Dark spot of Neptune, the Sun’s place for the largest sunspots. The 19.47 degrees latitude stress points can be explained if we consider the interlaced tetrahedron energy structures to be present in the sphere of these planets. The correspondence principle of the Hermetic principle ‘as above, so below’ is valid also for the Platonic solids in the aura, the energy field of the human body. Science in the nineties has actually corroborated the existence of the bio energy fields of the human body that were already known to the Chinese for thousands of years, know as the Chinese meridian system and the seven chakras in the body. The eastern Chakra systems of the body have been identified as nodes in the human body where vortexes of subtle energy from higher dimensions interfere with the physical body. Many ancient traditions mention that the etheric energy counterpart body of the physical body as the vehicle of the human soul. Supposedly the energy structure of the human aura contains the wave interference patterns of the Platonic Solids especially the star-tetrahedron (Star of David). The Merkaba energy field of the human body is an interlaced tetrahedra (double interpenetrating tetrahedra, one pointing upwards and one downwards, see the cover of this book). The Merkaba is mentioned in many religions such as in the Jewish Kabbalah that describes it as a counter rotating energy field that affects both spirit and body. 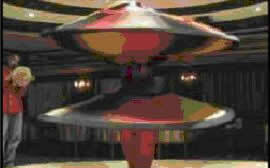 The Merkaba is also preserved in the Islam in the ancient Islamic mysticism of Sufism. The dervish Sufi dancer expresses the Merkaba by spinning in a counter clockwise dance his robe, creating two spherical discs that express the toroidial shape or torus shape of the Merkaba. In our modern times, sacred geometry researcher Drunvalo Melchizedek has put much effort in reconstructing the significance of the Merkaba, he mentions that the human body creates the Merkaba as an electromagnetic energy field around the body. Ananda Bosman has launched a whole new science that he has coined Vortexiajah. Vortexiajah stands for a physics of vortexes within vortexes that perfectly corresponds with Daniel Winters phi-physics. Ananda explains that the Merkaba or the Light Body Star Ship as he mentions it is the vehicle between the third dimension and other higher planes of existence. He claims to be able to travel out of body using his Merkaba. His first outer body experiences spontaneously occurred after a serious accident where he almost lost his life! He claims to be in contact now with a higher intelligence helping him to shape his new physics Vortexiajah! Another example is the geometry of DNA. DNA has the geometry of ten interpenetrating dodecahedra spiraling along the helix. It requires ten Phi spirals to create the top view of DNA. The basic geometry of DNA is that of a dodecahedron. Since Daniel Winter assumes that the universe is one huge super hologram and that everything in the universe is connected with everything else by means of Golden waves, he believes that DNA is electro-magnetically coupled with the Earth grid and the Zodiac by means of the fractal dodecahedron shapes of energy. But how does the ether relate to the zero point field that quantum scientists have discovered? Are they one and the same thing? The only difference I believe is how these fields are being described. Both fields describe energy that is everywhere in the universe. Quantum physics however describes the zero point field as the collective energy that is released (virtual photons) by all of the sub atomic particles in the universe when they fall back from their excited state to their ground states of energy (called the Lamb shift after Willis Lamb). The sum of all this energy is what creates the zero point field. On the other hand the sub atomic particles borrow energy (virtual photons) from the zero point field pushing them into a higher energy state. The give and take of virtual photons of energy is what shapes the zero point field. In this way empty space, the vacuum is actually a plenum of electromagnetic energy (virtual photons) spanning all frequencies in the electromagnetic frequency domain. In contrast with quantum physics the ether theories state that there are no particles only waves. The zero point in the ether theory of Daniel Winter is the perfect stillness, the alpha and the omega of creation. The zero point is perfect stillness and infinite movement at the same time. It’s the same thing. How can this be? The cascade of Golden waves creates an infinite series of higher harmonics and when all the waves are added up using the Fourier principle it creates a flat wave of zero Hertz, perfect stillness! Now think of a glass of water, if you start to vibrate it slowly, you will quit clearly see wave fronts in the glass. When we increase the frequency, it will be harder to notice the water surface is vibrating. If we add in all possible vibrations with frequencies ranging from extremely low to indefinitely high, the sum result of all these vibrations will turn the water into a smooth surface again. The water has become calm again. This calmness however is illusionary since the water is both at rest and shaking like hell all at the same time! That is what the zero point field in essence is; it’s complete stillness (zero Hertz) and filled with an infinite cascade of Golden harmonics all at the same time. The waves that create matter and that by means of fractals move into the nucleus in an increasing cascade of Golden waves, speed up and exceed the light speed. But where do they go? They center into the zero point, back from where they came. In this sense, the zero point is the alpha and omega of creation! Scientist like David Wilcock, Daniel Winter take the notion even further, they say the ether energy has properties of consciousness, they conclude that there is neither a dualism in the physical and the mental realm. The ether energy is pure consciousness energy and since it shapes our entire universe, the universe itself must be a living intelligent being. So if this fact can be proven ether physics seems to be a scientific corroboration of the tenets held by many Eastern spiritual traditions that the source of our universe is a life force energy, a spiritual energy called many names like Prana, Ki, Chi, Akasha to name a few. In this chapter we’ll present some ‘proof’ of this startling conclusion, although scientist take different notions to come to this conclusion. For instance David Wilcock refers to Russian studies that have revealed the very existence of torsion waves that travel as spiraling impulses through the ether medium at a billion times the speed of light. They are caused by many types of events such as the movement of physical objects but also surprisingly enough by human conscious thought! Russian discoveries revealed that our thoughts and feelings extend far beyond the body and travel through the universe! Quantum physicist David Bohm also believes that the universe is holographic in nature and that there is an undivided wholeness of all things, it is useless to think in terms of separate particles since they are like little whirlpools in the river, you can’t tell where the whirlpool starts and the river ends. Bohm goes on to say that life and consciousness are not only present in animate life forms but also in inanimate matter such as rocks since, energy, space, time and consciousness are not separate things according to Bohm. Daniel Winter explains consciousness as follows; wherever the ether waves fold back upon themselves to become fractal or recursive, they turn around to meet themselves creating not only gravity but also self-reference or self-awareness in the process. Self-reference is the principle of being self-aware and is the definition of consciousness according to the ancient Vedas. Indigenous tribes like the native Indians of America and the Australian aboriginals for instance have always claimed that everything from the raindrops to rivers, from rocks to mountains are alive. Conscious life is not restricted to animate life forms that dwell upon the land; the Indians believed that every material thing had a soul, including the land. To these people all of creation was alive and part of the whole; they worshipped the mountains and the rivers, the moon and the Sun just as much as the animals and plants. Our western culture regards the ancient religions as primitive since they worshiped the stars and planets as the Gods of the Heavens. Maybe they didn’t have such a primitive and poor concept of reality after all? Maybe it is us who have some catching up to do? It is now dawning in science that the universe may be self-aware. This implies that all atoms, planets, stars, etc, are self-aware and have some form of individuality. We can no longer speak of consciousness that is restricted to organic life forms alone; consciousness can reside in many forms including stars and planets. The universe itself may be one conscious being that we humans are a whole part of. This makes every single focal point of waves an individual consciousness that is part of the universal consciousness. Human individual consciousness focusing in the human body is simply a piece of the whole pie of consciousness. The brain is merely the antenna tuned to receive the individual consciousness from the universal consciousness just like the quantum brain theory suggests. Each individual mind however must also have access to the universal mind. It would explain how the universal consciousness was accessed by so many geniuses like the greatest philosophers, scientist, artists and musicians that have inspired us throughout the Ages. If we grasp and accept this, then within this holographic concept of consciousness our separate egos must be illusions. Daniel Winter’s Phi physics now tells us that it is conscious light that creates the material world! Could this universal consciousness that many like to refer to as God be the zero point in the ether, the still point, the fractal attractor in chaos theory that draws all the light of the world into itself where all is One? The zero point could be regarded as the source and destination, the alpha and the omega of creation. Daniel Winter tells us that it is this universal consciousness that focuses the waves into the zero point and keeps it spinning, it can be compared with the Gforce mentioned in EtherDynamics! But wasn’t God also associated with unconditional love? If God is really to be associated with conscious light then where is the love in all of these Golden waves? Manfred Clynes, a former concert pianist studied the relation between music and emotion. During his many performances he learned that certain parts of his plays moved people more than others. He wanted to find out what it was in music, what pitches and notes touched people more than others. He started a scientific career to find out. So it seems there is only one way the universal consciousness of the universe can create. It requires the loving non-destructive interference bending of light into fractal structures of geometries that allows the waves to stand and interfere eternally. The higher harmonics in the Golden Fibonnaci sequence are all based on the longest Phi wave, the carrier wave. The cascade of electromagnetic waves all braid on this Golden wave with the longest wavelength, the long phi wave or lo-Phi wave, the love-wave! Light in a straight line is energy, loving light bended around a focal point creates matter and it’s the universal consciousness that keeps the waves centered! The universal mind of the universe, God is the light and love of the world, just like the Bible has always told us; however we can now appreciate it from a scientific perspective! For the first time in history we’re able to really measure human emotions such as compassion, empathy, love, anger and frustration. The Heart Tuner uses the electromagnetic waves of the heart and the brain and is able to determine if there is harmony between them, in other words if there is coherence between heart and mind. What the Heart Tuners does is that it checks whether our feelings and thoughts are balanced. · Can be used to eradicate addictions. First of all, the sonic sounds of the heart, the heart beats are translated into electromagnetic pulses by the thymus of the heart and the glands in our body that act as piezo-electrical devices translating sonic pressures into electromagnetism. This is how the heart creates an electromagnetic field that can be measured as an ECG. What happens is that the frequency components in the spectrum become Golden Mean related (Phi)! Surprisingly also the brainwaves can become entrained, phase locked with the heartbeat waves! Brain and heart waves beat in the same pace and in the same phase connected by the Golden Mean (Phi). The result is our by now familiar cascade of Golden electromagnetic waves just like we’ve discussed before what is happening inside the atom. So how does the heart and brain waves that have long wavelengths connect and lock with the much shorter wavelengths of the DNA? It’s the Golden Mean ratio that bridges the scale of the long wavelength of the heart and brain waves to the short wavelength of DNA. Emotion is really energy in motion, e-motion. It is a roller coaster conveying the emotional energy from the heart to every cell in our body into our very own DNA. The energy of our emotions moves between these scales of long waves to short waves and is finally delivered to our DNA. Fritz Pop had discovered before the bio photons, the blue light in the body and assumed that it was somehow related to DNA, Daniel Winter now shows us how. When the heart expresses the emotion of love it creates a cascade of Golden Mean electromagnetic waves, in fact it creates gravity just like the atom does when it attracts by Golden Mean braiding electromagnetic waves into the zero still point. Why have we always associated love with gravity? Why do we use words like I’m attracted to you, like the moon is to the Earth, when we’re in love with someone? Why have our emotion always been associated with weight? Why are we heavy in love? When Isaac Newton saw the apple fall from the tree, he just discovered gravity. He ran off to tell others and explained the principle of gravity to others by saying that the apple is attracted to the Earth. The people stared and laughed at him, the whole idea seemed preposterous, how could an apple be attracted to the Earth? Are they in love? Only people in love are attracted to each other. It took Newton a long time before people started to get used to the idea of gravity as a force of attraction. In those days, Newton had better taken another word to explain the principle of gravity. However taking Daniel Winter’s theory of gravity the word attraction seems just fine, it’s seems appropriate to say that the Earth and the moon are in love and that it is gravitation that is drawing a man to a woman! 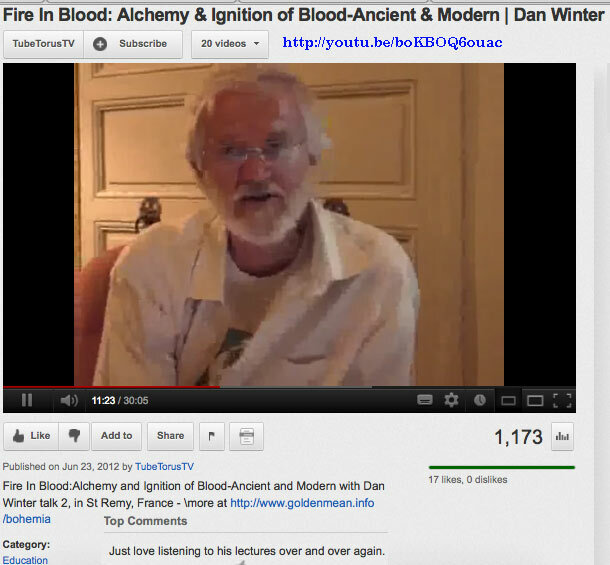 Daniel Winter also used his Heart Tuner on a trained yogi who went into a deep state of meditation. Formally he had instructed the yogi to focus on a tree and to send loving thoughts to the tree. He placed an antenna near the tree and linked both the yogi and the antenna near the tree to his Heart Tuner. The Schumann resonance is somehow related to human consciousness, brainwaves operate in a frequency domain that includes the 8-Hertz Schumann frequency. Spacecrafts of the NASA are all equipped with a device that simulates the natural Schumann resonance frequency. From early space travel NASA learned that astronauts get disoriented and distressed when they are shut off from the Schumann resonance, all human beings depend on it. Daniel Winter demonstrated that the trees in the woods act like huge antenna that pick up the Schumann frequencies and amplify it. When hooked up to the Heart Tuner he noticed first of all that that the yogi’s ECG and EGG were coherent as expected. However he also found that the yogi’s brainwaves and heartbeats had become coherent with the Schumann resonance of the Earth! What he demonstrated with his experiment is that when we feel love we tune into and become one with nature itself. Daniel Winter now believes that all biologic life depends on the Schumann resonance as the carrier wave, the long Phi wave to braid electromagnetic Golden waves. Humans can link up to biology and to mother Earth itself for that matter, the heartbeat of this planet is the Schumann resonance. It may be the explanation why a walk in the woods is so refreshing and why people like to spent time in nature. Being completely shut off from the Schumann resonance on high altitudes in a plane whereas the fuselage acts like a big Faraday cage, is now believed to contribute to the effects of a jet leg. Daniel Winter warns us for the hazards of electromagnetic smog in our biosphere, it destructively interferes with biology itself and finally causes cancer. We’ve shielded ourselves from the natural Schumann resonance by hiding in concrete buildings and by destroying the green forests of the globe, the antennas that amplify the Schumann resonance. The power grid in the United States that drains current into the Earth causes the worst case of electromagnetic pollution and this activity should be stopped immediately according to Dan Winter! Nikola Tesla around 1900 was the first to experiment with two spiral coils (caduceus shaped). He fed the two coils with opposing alternating currents such that they would create electromagnetic fields that would be self-canceling. Although the electromagnetic fields were cancelled out, he demonstrated that his Tesla coils were able to transmit nonetheless energy over long distances. He had actually discovered a new form of energy. Remarkably Tesla’s waves did not loose its energy at the inverse square of the distance as normal electromagnetic energy does, even over long distances there was no loss of energy to be noticed. Tesla’s work on this revolutionary new form of energy was almost forgotten in history. It retrospect it seems his work was to revolutionary to be accepted by society in the last century especially its application of free-energy. This is why his work nearly went down in history to be forgotten. Fortunately the same form of new energy was independently rediscovered in the nineteen fifties during the cold war behind the Iron Curtain by Russian astrophysicist Dr. Nikolai A. Kozyrev (1908-1983). Kozyrev’s discoveries were kept secret by the Soviet Union during the cold war. It was only after the fall of the Iron Curtain that Kozyrev’s discoveries were slowly revealed to the West. In the Soviet Union thousands of academics have delved into this subject after Kozyrev’s initial discovery of this new form of energy. Kozyrev proved the existence of the ether once and for all. This new energy is neither electromagnetic in nature nor does it relate to gravity as it stands on its own. The new form of energy discovered by Kozyrev is a spiraling non-Hertzian electromagnetic wave that travels through the vacuum at super-luminal speeds, a billion times (10? C) faster than light. Due to the spiraling nature of the wave, the wave is called a torsion wave since it traces a spiraling path! According to independent researcher David Wilcock the torsion wave also traces a perfect Phi spiral! Torsion waves are called non-Hertzian waves since they do not obey to the classical theory of Hertz and Maxwell. Einstein and Dr. Eli Cartan predicted the existence of static torsion fields in 1913 in a theory that became known as the Einstein-Cartan Theory, or ECT for short. Torsion fields never got very much interest in physics until Kozyrev discovered their very existence. We already discussed torsion waves in chapter 4 about the zero point field, where we mentioned that Tom Bearden discovered that the fundamental wave in the electromagnetic wave is a scalar wave. The scalar wave is the wave that remains when two opposite electromagnetic waves interfere canceling out the electric and magnetic field components, just like Tesla did. The result is a hitherto unrecognized component in the electromagnetic wave, a longitudinal wave vibrating in the same direction it is traveling. (Classical electromagnetic fields are transverse wave, vibrating perpendicular to its propagation). Scalar waves and torsion waves are just synonyms for the same wave. Torsion waves now seem to play a significant role in explaining our physical reality. Although torsion fields are very weak they can be measured using torsion beam balances that were first developed by Kozyrev. Torsion waves create minute forces in matter and that’s how they can be detected. Torsion fields can be either static or dynamic. Static torsion fields can take on the form of vortexes like the one mentioned in the Phi physics of Daniel Winter. These static vortex torsion fields in the fabric of the vacuum space can stay in one place for a very long period of time. Kozyrev discovered that torsion fields can also propagate through space as torsion waves at tremendous speeds at least one billion times the speed of light (10? C). He noticed that all physical objects both absorb and radiate torsion waves. By shaking, vibrating, deforming, heating and cooling physical objects they generate measurable torsion waves. Even the displacement of an object already generates torsion waves that can be measured. All movement therefore from the vibrations of atoms to the orbits of our planets and stars leaves their traces in the form of torsion waves in the ether. A very remarkable phenomenon that Kozyrev discovered by rotating gyroscopes is that they loose very small but measurable amounts of weight. Also firmly shaking objects could make objects loose weight. Now from our current understandings of physics this is quite impossible! It violates all physical laws, how can solid matter loose weight when it is spun at high speeds or shaken? If we still believe that matter is made of little hard marbles called particles, yes this would be a great mystery! However Kozyrev showed that the gyroscopes shed more torsion waves when shaken or spun, so that etheric energy that sustains the object was shed back into the background sea of the ether. The momentary loss of ether energy accounted for the weight drop. Dr. Harold Aspden of Cambridge University discovered a related phenomenon. He attached a powerful magnet to a gyroscope and spun it at high speeds. He measured the amount of energy required to accelerate the gyroscope to full speed to be a 1000 Joules. Now to his surprise when he stopped the gyroscope from spinning and restarted the gyroscope to spin again within 60 seconds after it stopped, it required 10 times less energy to spin the gyroscope to the same speed. The spin of the gyroscope had added extra spin to the ether that sustains the gyroscope that lasted for a while before it wears off, it’s like the momentum stored in the tea of a teacup after stirring it with a teaspoon. We now know that spinning magnets are strong torsion wave generators. Another violation of the laws of Newton with respect to torsion fields comes from Bruce DePalma. He conducted experiments where he catapulted two identical steel balls at the same speed under the same angle into the air. The only difference between the balls was that one of the balls was rotating at 27000 revolutions/minute and the other was not. The spinning ball reached far higher into the air than the non-spinning ball. By the spinning of the ball torsion fields were created that caused a slight change in the total mass of the ball. The counter rotating Phi spiraling electromagnetic waves in the Phi physics of Daniel Winter that spiral into the nucleus of the atom likewise cancel the electromagnetic components of the electromagnetic waves and results in a torsion wave. This is how I believe torsion waves can be explained in the vortex structures of electromagnetic energy that create the atom according to Daniel Winter. Anyhow, Russian scientists have proven that electromagnetic waves are always accompanied by their more fundamental torsion waves. Static torsion fields in the form of vortexes in the ether and the spiraling torsion wave traveling at super-luminal speeds are getting more and more attention in Western science. According to some, torsion waves are the missing link in the search for a final ‘theory of everything’, Einstein’s unified field theory. It seems that electromagnetism, gravity and torsion waves are all members of the same family; they are just different forms of ether vibrations. Consciousness is related to ether vibrations. Torsion waves may be the physics for telepathy, the ability of mind reading between two individuals. Since torsion wave can physically affect matter, it may also be the explanation for psychokinesis or PK, the ability to mentally change physical objects. Stage performer and spoon bender Uri Geller has always demonstrated these abilities in front of large audiences. Although many still think he was a conman, he has been subjected to scientific scrutiny but they could never disprove his ability. During the cold war Russian scientist have experimented a lot with psychics because they believed that their abilities were genuine. In 1984, Dankachov showed that static torsion fields could also be memorized in water. Water proves to be a good medium for storing static torsion fields. The late French biologist Jacques Beneviste has proven that water is able to memorize the constitution of chemical compounds that were dissolved in it. Somehow a torsion field can be created in water that is a fingerprint of the chemicals dissolved in the water. After diluting the water a great number of times such that no possible molecules of the original chemical compounds could be found, the strong diluted water still maintained its properties as if the original compounds were still in there. What had happened is that although no molecular traces could be found in the water, there was still the imprint in the water of the original torsion field of the chemical compounds. Beneviste also demonstrated that by simply placing a second bottle next to the first one he could xerox the properties of the water from one bottle to the other. The torsion field of the first bottle of water was induced into the second! Prof. Dr. David Schweitzer is able to photograph this memory effect of water. He has a fairly simple method to measure the water memory effect of water and the imprint they leave behind in the water. He takes a water drop and allows it to dry up under a tilted angle. Next he investigates the dried up water drop under a microscope and shows how interesting light structures become visible. The imprint of human intention into the ice crystals of Dr Masuru Emoto is yet another example that can be explained by torsion waves that are radiated from human thoughts and emotions. The torsion fields created by human intention are simply memorized in water. At an invisible level the internal structure of water has changed. After freezing the water these changes become manifest to the naked eye in the different shapes of the ice crystals. At Sound Energy Research they create torsion field imprints in water using scalar (torsion) wave technologies. At Sound Energy Research they treated distilled water with a scalar waves and a coil developed by Dr. Glen Rein. The result is structured water called scalar wave structured water™. They sent samples of this water to Dr Masuro Emoto who froze the water samples and studies the crystals. They formed perfect geometrical hexagonal structured ice crystals. 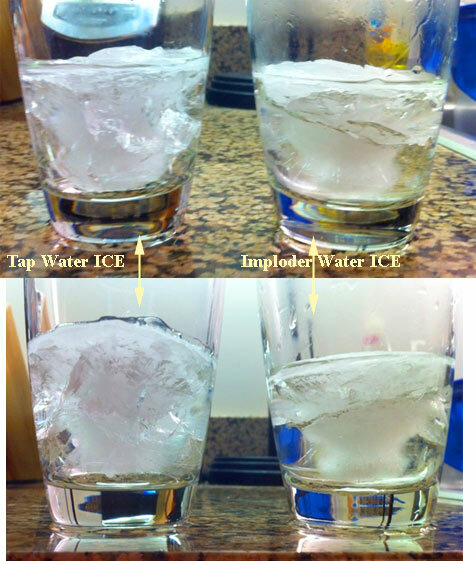 This is yet another example that indirectly proves that consciousness and torsion waves are related since both human conscious intention and scalar waves seem to produce the same results in Dr Masuro Emoto’s experiments with ice crystals. Torsion waves are very remarkable waves as they never wear off, they propagate to the far corners of the universe without loosing their momentum and in this respect they have eternal life. Torsion waves as they travel through the physical vacuum do not encounter any friction; therefore they maintain their energy. As torsion waves traverse the universe they interfere with other torsion waves. Over time they weave a tapestry of the history of all that has ever happened within the universe from the movement of the smallest sub atomic particle, to the revolution of the planets, and the expansion of galaxies. Remember that torsion waves are generated by many phenomena such as the vibration or displacement of matter, electromagnetic energy and our conscious thoughts to name a few. Torsion fields are therefore information fields as they encode everything that has left its traces in the form of torsion waves in this universe. This boils down to the recoding of every little thought that was ever thought and every little move that was ever made. The interference patterns of the torsion waves form a huge hologram that permeates the whole of the universe. Torsion waves allow for information transfer across the universe, connecting every atom in the universe with every other atom and since torsion waves travel at super luminous speeds they could be the explanation of the non-local effects that were predicted in theory and discovered by experiment in quantum physics. The information field created by torsion waves in the universe allows for a coherent whole of the universe, connecting every little atom in the universe with all other matter in the universe informing it of its whereabouts and activity. In fact scientist are discovering a very high state of coherence in our physical universe that can not easily be explained when the universe is a bunch of single individual parts of atoms, molecules, planets and stars that only maintain contact by separate forces such as gravity acting upon them. Quantum entangled particles keep their coherent relation eternally and are not bothered by any distance separating them whether it be a few millimetres or the distance of a galaxy. These relations can only be explained if an invisible field permeates the universe that interconnects them. The information field described above is termed the A-field by Professor Emeritus Ervin Laszlo. Laszlo in the last four decades developed an integral theory for everything, instead of specialising in one particular field, Laszlo has studied many fields of science and finally developed an integral system theory. According to Laszlo the A-field is more fundamental than energy and matter in the universe. It’s this primordial information field that is the ground of our universe interconnecting everything with everything rending our view of separate entities in this universe useless. In his system theory there are no separate entities as all ‘separate’ entities that we observe in our universe are all embedded in one seamless interwoven net of connections. The A-field of torsion waves may be new to science, its existence has been known for thousands of years in the East. The only new thing about it is that it is being rediscovered by western science. Eastern spiritual tradition has named this field the Akashic field. Akasha is a Sanskrit word meaning radiating or shining, it’s the equivalent for ether. Akasha is the womb of creation bringing forth every physical aspect that can be perceived with the senses according to eastern traditions. In ancient eastern spirituality the history written within the Akashic field are called the Askashic chronicles, the book of life that records everything that has ever happened or will happen in the universe. The Akashic chronicles or Akashic records contains the story of every soul that ever lived on this planet. The Akashic records, are holographic torsion fields of individuals that embed in larger holograms of groups of peoples such as nations. The holograms of nations weave the hologram of humanity on Earth and resembles to what Carl Jung called the collective mind of man. The A-field or Akashic field can explain the psychic abilities reported by many people to see into the past and know about events that took place in this world that were not perceived by any personal cognitive conscious experience. The Akashic records are the storehouse of information that has been consulted by all great seers throughout the ages including Edgar Cayce. The author of this book, personally testifies that psychic gifted people are able to read the Akashic records. For a lengthy time in the past I have been consulting a paranormal practitioner. Being born as a very sceptical person, my disbelief in the paranormal however eventually melted as I was confronted with many unusual cures that I could not explain. I also shared many experiences with other clients of this practitioner during the long waiting hours in the waiting room. In one of my consults I handed him a photograph of someone close to me without disclosing any prior details about the person in the picture, not a single word. I simply asked if he could help this person. He held his hand above the picture to sense it while he started to reveal to me what had happened to this person in clear details and quiet explicitly explained the situation this person was in. The information hit me right in the face for I knew he was right. I was totally flabbergasted by the experience since there was no way he could know the details he was revealing to me! From this moment on I knew with absolute certainty that there was something fundamentally missing in my understanding of what I believed to be my materialistic reality. To me this personal experience changed my sceptic belief of the paranormal once and for good. I can therefore from my own experience testify that psychic abilities to read the Akashic records are real and that indeed everything that has every happened in this world must be written in the vacuum fabric of space and time. Human consciousness is able to read this book of life. I think everyone of us at least has had one or more experiences in his life where he or she suddenly had access to information not perceived by the senses. What we call intuition, a sudden insight or feeling that informs us about a situation, may be explained by moments of unconsciously tapping into the Akashic field and having access to information we can’t logically explain. Sometimes we just know things! Twins who are emotionally very close often keep a telepathic contact and unconsciously know about each other especially when the other twin half is in distress. Twins often have an ability called twin-pains, they are able to sense the pain of the other half in cases of for instance a severe toothache. Owners of a dog know that their dogs are often mysteriously able to sense their bosses return home after a long day at the office. Animals in nature are able to sense a pending Earthquake. Hours preceding the actual quake animals start to respond very nervous as if they sense something terrible is about the happen. Earthquakes are accompanied by a tremendous release of torsion waves as a result of the frictions that occur in the Earth crust prior to the quake itself. These intensified torsion waves are most likely sensed by the animal’s consciousness and may explain for their nervous behaviour in anticipation of the quakes. Humanity has somehow lost its paranormal abilities that are still common in animals. During the tragic events of the tsunamis that took place on the 26th December 2004, rescue workers in the aftermath of the Earthquake were amazed to found an almost absence of dead wildlife while there were so many human casualties. The reason may be that animals used their 6th sense and felt the impending disaster that caused them to flee to safer places in the higher mountains. However it seems our current understanding of psychic abilities and the paranormal is finally catching up. Explanations for psychic abilities have now come into the domain of science that for the first time in history is able to give a rational explanation for these abilities that have been ignored, ridiculed and dismissed out of hand for so long in the West. For the first time in recorded human history we may have a unified theory of everything (T.O.E.) within reach that not only explains our physical universe but also connects it with consciousness closing the gap between science and spirituality 300 years after Descartes once and for all. The empty space of the universe is not empty at all. It contains a spiritual energy that modern day science has rediscovered as the ether but this energy has been known for thousands of years in many ancient spiritual traditions by names such as the Chi, Ki, Prana or Akashic energy of the universe. This energy not only shapes the physical world moment by moment, it is also related to consciousness. Contemporary science is revealing that the firm belief in a distinction between the material and the spiritual word is false. There is no duality, the universe is constructed from one and one substance only and both the physical and mental world springs forth from the ether. Amit Goswami, Daniel Winter and David Wilcock are a few of the scientists who have crossed the bridge between science and spirituality and who now believe that the primordial conscious energy of the universe is the first cause of creation. The ether energy can arranges itself into basic geometrical wave patterns that were named after Plato, the Platonic solids to form matter. Plato for 2350 years ago already wrote that the physical world was constructed from the Platonic solids. The Platonic solids arrange themselves in what chaos theory calls fractal patterns weaving a matrix in space interconnecting atoms with the stars. The scales of the Platonic solid shapes are different but the ratios between them are still the same (following the Hermetic principle as above so below). The suggestion coming from quantum science that the probability waves are real wave are believed to be true now. This finally solves the enigma of the wave particle duality of quantum science. There are no particles in the universe, only waves. What we see as a particle is in fact the focal point of vibrations. The idea that God is the light and love of this world as mentioned by many world religions can be taken literally after studies of the work of Daniel Winter. Matter is created from pure light (electromagnetic and torsion wave energy) and as we have demonstrated there is a distinct relation between love and the Golden Mean ratio (Phi) that is required to sustain matter. Since the focal point of these waves creates consciousness awareness, every atom in the universe is conscious and the universe itself is One consciousness being. The universal consciousness, God is all that is, he’s omnipresent and omnipotent. He’s aware of all things going on in the universe because he’s the universal consciousness and all that is. Matter in the universe is attracted by means of Golden Mean braiding of waves towards to the zero point the alpha and omega of creation. It is the love in those waves that creates the gravity. The late and legendary R. Buckminster Fuller the subject of the Beatles song ‘Fool on the Hill’, discoverer of the importance of sacred geometry, used to put it this way: ‘Love is metaphysical gravity’. If there wasn’t any love in the waves that shape matter they would start to destructively interfere and the universe would collapse into a great void. God is the Gforce in Ether Dynamics and the fractal attractor in chaos theory, attracting all waves towards the center where all becomes One. Russian scientists rediscovered Tesla’s new type of non-electromagnetic energy that travels in spiraling ways and called it torsion waves. Scientists now belief that torsion waves can be regarded as information carrying waves rather than energy waves. It was proven that torsion waves are linked to human consciousness and are created by human thought and emotions. Torsion waves are the interface between the mental and the physical world although we must keep in mind that in reality there is no duality between them. Torsion field physics is the promising physics of psychokinesis and telepathy and shows us how the universe creates a hologram that resembles the ancient information field of the ether better known as the Akashic field. The Akashic field is the book of life that keeps a record of all that has ever happened in this universe and all that will ever happen in the future. The DNA double helix as the template of all life forms has been around in science for some odd fifty years now since their discovery by Crick and Watson. Our knowledge about DNA since then has dramatically increased. DNA stores the chemical molecular instructions for cellular reproduction. It is a blueprint for the reproduction of all the proteins that are found in the cells of an organism. The human body contains some estimated amount of 70.000 to 90.000 different proteins. The DNA helix is a twisted double string. Each string is made of an estimated 3.1 billion nucleotides. The nucleotides are all linked together to form this immense chain. There are only four different base nucleotides used in the chain. These bases are denoted by their initial character adenine (A), cytonsine (C), guanine (G) and thymine (T). Three of these bases in a chain form a triplet or codon. There are only 4³ = 64 different types of codons in the DNA chain. Each triplet or codon is the genetic equivalent for one amino acid, the building block of a protein. One protein consists of some hundred amino acids, so it takes the same number of codons to code one protein. The sequence of codons that encodes a single protein is called a gene. Nucleotides form base pair bridges between the two DNA strings. One of the nucleotides of a base pair is in one of the DNA strings, the other in the opposite DNA string. In this way the base pairs form a bridge, a chemical bond between the two DNA strings tying them together in a twisting staircase like double helix. Of the complete chain of triplets in a complete DNA string only 5% is used for the coding and reproduction of proteins. The other 95% is called junk or dormant DNA; it seems to be a senseless repetition of triplets that western science simply doesn’t know what to do with it. For a very long time scientists believed that the 95% non-coding part of the DNA is completely redundant. There is now strong evidence that the non-encoding DNA is not useless after all but in fact may be more important than the encoding codons. Revolutionary new discoveries revealed that the idea that the inherited genetic make up of an organism cannot be changed is wrong. It has been proven that the sequence of the DNA molecule’s codons can be reprogrammed! The most profound study ever performed on the 5% encoding triplets of the human DNA string was conducted in an international joint effort called the International Human Genome Project. The task of the Human Genome Project was to identify the complete structure of the human DNA and map its triplets and genes. Since the human body contains at least 70.000 different proteins, it was expected to find at least some 100.0000 genes in the human DNA, 70.000 to explain for the physical reproduction of the human body (protein encoding genes) and some 30.000 different genes to explain for the differences in personality and character. When the first draft version of the human genome was finished in 2001 and the final version in 2004, the high hopes and expectations of biologist in the world were shattered to pieces when only 30.000 genes were found in the human DNA. Thirty thousand genes in the human genome is only three hundred more that it takes to build a mouse. The Human Genome Project also revealed that we share 98 percent of our genes with chimpanzees! All our assumptions about DNA as being the sacred book of life containing all the text to write each chapter in biology now have to be re-evaluated. The DNA differences between a human being and the primate that we evolved from are simply to small to explain for the differences in appearance let alone the immense difference in conscious awareness and intelligent abilities. On the DNA level we have more in common with dolphins than with apes. While western science invested in the International Human Genome Project focusing on the 5% of the encoding triplets of DNA, in the Soviet Union in 1990 a group of Russian scientist of the Russian Academy of Sciences was formed to study the complete human genome. This research was lead by Dr. Pjotr Garjajev, member of the Russian Academy of Sciences as well as the Academy of Sciences in New York. The Russian research was taking a wide angle and held an open view in their studies. The research team included bio physicists, molecular biologist, embryologist and even linguistic experts. Their research revealed that the supposed junk DNA that has been completely neglected and forgotten by western mainstream science, was no redundant leftover of evolution at all. Linguistic studies revealed that the sequencing of the codons of the non-coding DNA follow the rules of some basic syntax. There is a definite structure and logic in the sequence of these triplets, like some biological language. Studies further revealed that the codons actually form words and sentences just like our ordinary human language follows grammar rules. Scientists have conducted many studies on the origins of human languages and the origins of the grammatical rules that are so essential to all human languages, however they have always failed to find the source. But now for the first time in history the origins of language may be surprisingly attributed to DNA. The language of the genes is much and much older than any human language that was ever uttered on this globe. It even seems more like it that the DNA grammar was taken as the blue print for human speech. Whereas the western Human Genome Project deciphered the ‘machine language’ code of the DNA molecule, the structure of the DNA ‘bits’ formed by the sequence of nucleotides, Russian scholars discovered the high level language present in DNA. Another amazing fact that Garjajev’s group discovered was that the DNA is by no means a closed book of life. He discovered that the text of the DNA book could be altered. The codons of the DNA string can be rearranged in different sequences. In other words the software of the human genome our DNA molecule can be reprogrammed! Studies revealed that the junk DNA seemed to be jumping DNA. Triplets of the DNA string were able to exchange places. Since the DNA was found to have a syntax and semantics akin to our human languages, it was proven that our currently restricted perception that DNA only served for the coding of the reproduction of the proteins for the chemical make up of an organism is only half of the story. When DNA in vitro test tubes were exposed to coherent laser light, the laser light spiralled along the DNA helix as if it was guided by the structure of the DNA molecule. The most amazing effect was noticed when the DNA itself was removed and the laser light kept spiralling! The vacuum of the space that was just before occupied by the DNA had changed and something caused the laser light to keep spiralling. These effects have been measured and remained for lengthy times. The effect is now becoming well known as the DNA phantom effect. Vladimir Poponin and his team of Russian Academy of Sciences repeated the work of Garjajev at the Hearthmath institute in the U.S.A. Poponin concluded again that a field structure was formed in the physical vacuum even when the original DNA was removed. We’ve seen similar examples of vacuum changes before that could be attributed to torsion fields. The most astonishing experiments that were performed by Garjajev’s group are the reprogramming of the DNA codon sequences using modulated laser light. From their discovered grammatical syntax of the DNA language they were able to modulate coherent laser light and even radio waves and add semantics (meaning) to the carrier wave. In this way they were able to reprogram DNA in vivo (in living organisms) by using the correct resonant frequencies of DNA. The most profound discovery made sofar is that human linguistic words can be modulated to the carrier wave with the same reprogramming effect. Now this is a baffling and stunning scientific discovery! Our own DNA can simply be reprogrammed by human speech, supposing that the words are modulated on the correct carrier frequencies! Laser light therapies based on Gajajev’s findings are already applied in some European academic hospitals with success on various sorts of skin cancer. The cancer is cured without any remaining scars. Daniel Winter and his heart coherence team have found proof that human emotions can reprogram DNA as well. The sonic beatings of the heart in rhythm with our feelings, our emotions are transformed into electromagnetic energy in the body’s glands that act like piezoelectric couplers creating smaller electromagnetic counterpart wavelengths of the emotional sounds of the heart. The emotion becomes energy in motion, e-motion, sending it right down to the DNA of every cell of our body as blue coherent laser light that is able to modulate the DNA codons just like the lasers of the Russians did. On close examination from the top view of the DNA it has a dodecahedron shape. There are ten Phi spirals required to create the dodecahedral helical shape of the DNA spiral. The DNA molecule as a wave shape is attuned to the heart and able to receive its sonic emotions. Daniel Winter explains the implosion of long waves into short waves as the mechanism that conveys the emotions of the heart to our DNA. The scale (wavelength) is different but the ratio of the wavelengths is the same maintaining the Golden Mean ratio. Not only emotions feed our DNA with blue ultraviolet light, also cellular metabolism the consumption of food is all about creating short wave blue light that feeds our DNA. Plants receive this light directly from the Sun using chlorophyll in their leaves and use a process called photosynthesis to bind the photons of the Sun. Animals consuming these plants get these bio photons indirectly from plants, the accumulation however has become less effective. This coherent light of the Sun is stored as bio photons in the organism. The purpose of the metabolisms in both plants and animals is to create highly coherent ultraviolet laser light inside our DNA that drives cell replication. Many studies have revealed that there is a clear relation between our mental and emotional state and our health. People who suffer from depressions and negative emotions for longer periods in the long run will harm their health as well. Isn’t it that the one who talks the most about diseases is the one who eventually gets it? Fear is a very negative emotion that does not benefit health. Scientific studies have proven that no matter how well babies are fed, when they lack the caressing and loving touch of their mothers they eventually die! The loving hugs of the mother are sent right down to the DNA of the baby! Daniel Winter makes it abundantly clear that our emotions program our DNA and shape the immune system of our cells, creating strong health. Negative emotions destroy the coherence of the immune system while positive emotions enhances it. According to Winter the healthiest thing to do is to have as much bliss and ecstasy as possible in our lives since it is the healthiest emotion that in the long run gives us longevity. The wave processing and modulating properties of DNA have revealed a total new purpose for the DNA molecule. For a long time we have believed that the only purpose for DNA was that it serves as the carrier of genetic information for the reproduction of life. This now seems to be only half of the equation. Gajajev and others in a paper titled the ‘DNA wave Biocomputer’ postulates that DNA is no less than an intelligent biological computer, it‘s an intelligent apparatus that is able to store and retrieve biological information from all the cells of the body, connecting the chromosomes of all cells into a holistic continuum, a kind of biological internet inside the body. The DNA chromosomes acquire unlimited information from the metabolisms that occur in each and every cell and in turn produce regulative electromagnetic signals as a feedback. All of the billions of cells that make up our body are in instantaneous communication with each other. In quantum mechanical terms, they are non-locally connected. This allows for coordination of the countless complex biochemical events that take place inside our body to be regulated in a coherent way. Information exchange in the body by means of the nervous system and the intercellular biochemical molecular diffusions are processes that are way to slow to explain the instantaneous response our body is able to give to external stimuli, nor can it account for the stunning coherence with which all of our bodily functions act in unison. Other proof that our body is a single super coherent operating bio system comes from Cleve Backster. He has been able to proof that cells isolated from the human body still maintain in communication with our body even if they are transported far away from the body. He used two lie detectors, one was connected to a volunteer, the other to cell samples that were taken from his mouth and stationed twelve kilometres away from this person. He was able to proof that changes in the emotional state of the person being tested were reflected in both lie detectors simultaneous, the one attached to the person’s body and the one to the isolated sample of cells. The only explanation for this experiment is that all our bodily cells are connected non-locally no matter how far they are apart and that this connection remains even when cells are isolated from the body. According to Gajajev, the genomic information of the organisms is also stored non-locally, this means that it is not restricted to the DNA molecules itself. The DNA molecule merely acts as a storage device that is able to read and write the genomic information from a non-local distributed field. 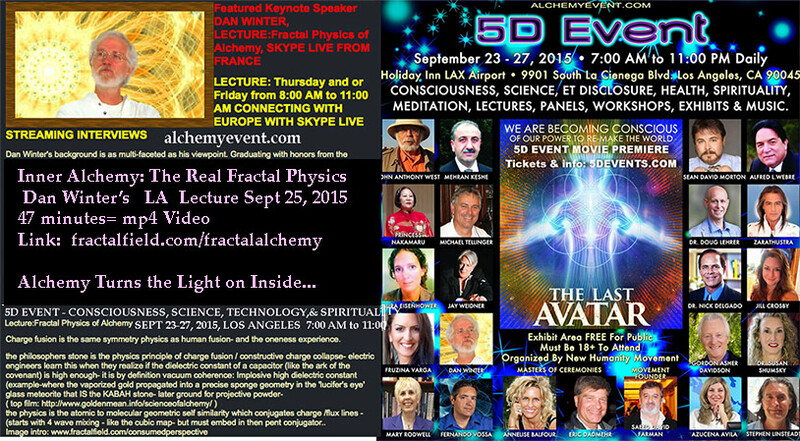 DNA acts like a fractal environment that stores the coherent blue laser light in a holographic way. This genomic hologram can be read using either electromagnetic or acoustic fields. DNA acts as a kind of aerial open to the reception of not only the internal influences and changes within the organism but to those outside it as well. Indeed we regard this as one of our primary findings, which in view of quantum nonlocality of organisms extends not only to the organism's local environment, but also beyond it to the extent of the entire universe. Remember from chapter 3 ‘Science and consciousness’, paragraph ‘morphic fields’ that biologist Rupert Sheldrake had already proposed the morphic field. Morphic genetic fields encode genetic information that is shared by all members of a species. The DNA bio wave computer model proposed by Gajajev and his group shed a whole new light not only on where and how the genetic information is actually stored but also where it initially came from. If genetic information is actually stored in morphic fields in the fabric of space and time, we may also start to re-evaluate Darwin’s evolution theory. Darwinism has received a lot of criticism in the last decade since although Darwinism has been around since 1859, it is still unable to answer many questions related to the evolution of the species. For one thing Darwinism is unable to explain is the explosion of sudden new life forms that appeared some 530 million years ago on this planet. The abundant new higher life forms that came into existence with a higher level of biological complexity than previous life forms, required all sorts of new proteins and corresponding genes in a relatively very short time span. The explosion can hardly be explained by a spontaneous increase in the number of natural mutation of genes. It is also hard to imagine how a complete new species develops from its predecessor, since it requires an abundant amount of coherent spontaneous mutations taking place all at the same time to create all the new features of a new specie. It is also hard to conceive that nature was able to create such biological complex systems such as the eye by simply dicing a bit with the codons of the DNA molecule. All biological systems such as the organs, the immune system and the senses are far to complex to have come into existence by mere chance alone. The problem with these complex biological systems is that they did not gradually developed over many of ‘prototypes’, since these prototypes are missing in the fossil records all together. Many new biological functions such as eyesight were spontaneous creative inventions in the evolutionary process. When more and more fossils were found in the quest to find the missing links in the fossil records, paradoxically more and more evidence was being collected that evolution took place in quantum leaps of species such as from invertebrates to vertebrates. The development of new species requires the involvement of many new biological functions coherently at same time. For new species such as birds to emerge it is not enough to just develop feathers, it also requires lightweight bone and muscle structures. If a mutant only developed feathers, these mutants would not render a biological advantage and natural selection would eventually eliminate the new life form. We humans supposedly stem from the apes, but evolutionists were never able to really proof these assumptions. Mathematician Fred Hoyle came up with a beautiful and credible analogy to proof that evolution can hardly be considered a lucky roulette game. He used the analogy of the three dimensional puzzle called the Rubik cube. Each face of the Rubik cube is constructed from a matrix of 9 smaller cubes per face. Each of the three layers in the face of the Rubik cube can be pivoted around both a vertical and a horizontal axis. When the puzzle is solved, all the Rubik cube’s faces will have the same colour. Suppose we give a Rubik cube to a blind man and ask him to solve the puzzle. Hoyle calculated that the blind man requires an expected 5 x 10¹8 turns to solve the puzzle. Suppose he makes one turn per second then it will take him 5 x 10¹8 seconds = 126 billion years to complete the puzzle by chance. This is longer than the age of our universe! Now suppose we help the blind man by advising him on a yes or no for each turn he is attempting, then the puzzle can be solved in only 120 turns requiring 2 minutes to solve the puzzle. To solve the Rubik cube we only need to align 9 * 6 = 54 smaller cubes, however to solve the puzzle of life, it requires 3.1 billion nucleotides to be perfectly aligned in the DNA strings! Now do we still believe that evolution was the work of a blind man? Cambridge University Professor of evolutionary biology Simon Conway Morris believes that there must be a divine cause for our evolution. His unorthodox view of a divine cause is not very popular among his colleagues. Although he does not believe that man is the splendid accident of evolution, he makes it crystal clear that he doesn’t adhere the vision of creationist whose only truth it is that God created the world in seven days. He brings up some new and very interesting arguments. According to Morris evolution has come up with the same solution to problems many times. For instance the camera like solution of the eye has been ‘invented’ at least 6 times by completely different species that did not pass this solution on by means of exchanging genes. Simon Conway Morris shows that there are abundant examples in nature of identical convergences of biological functions, identical solutions that emerged completely independently within different species. He says that environmental factors such as oxygen, water sunlight and gravity probably narrow the possible solutions down to only a few restricted solutions. So if there is convergence in the development of biological functions, it means these convergences were no coincidence. Another difficult question for Darwinists to explain is the sudden leap in intelligence and consciousness that occurred to the Neanderthals some 35.000 years ago. From hunting, cave living Neanderthals they made this enormous cultural and intelligent progress. By tool making, farming and animal keeping, mankind for the first time in evolution made life a lot more comfortable since chasing animals in the wild was no longer the only option. One of the most important pillars of Darwinism is that gene mutations take place irrespective of external changes in the environment. The reason why the adapted species survives the changes in the environment is because they are ‘coincidentally’ better equipped to survive. Natural selection takes care that these better-equipped mutants will survive; this selection process is called the survival of the fittest. Dr. Bruce Lipton however disagrees with this axiom of Darwinism completely and says that cells themselves have the ability to perfectly rewrite their own DNA when the external environment demands it. Harvard geneticist John Kearns delivered proof for Dr Lipton’s hypothesis in 1988. He placed bacteria that could not digest milk sugar (lactose) in an environment that only contained lactose, so it was their only possible source for food. Instead of dying off these bacteria were able to reprogram their DNA such that they were able to survive and feed on the lactose. So here’s another source claiming that DNA reprogramming is possible! The last thing in Darwin’s theory that may become extinct is most likely Darwinism itself, the scientific criticism is growing and alternative evolution theories are emerging. The most radical opponents to Darwinism are the creationist who simply believe in the literal text of Genesis in the Bible and fiercely debate that it was God who created Adam and Eve and all other life on Earth some eight thousands years ago. Of course this simplistic rather fundamentalist blind belief in the Bible cannot be taken serious as the fossil records contract it altogether. In 1995 however a new more serious evolution theory emerged the ‘Íntelligent Design’ theory. The founder of the Intelligent Design theory is Michael Behe who launched his evolution theory in a publication titled ‘Darwin’s Black Box’. The Intelligent Design theory states that life on Earth is the result of an intelligent design in stead off by an unguided process of trial and error. The Intelligent Design theory adherers unlike the creationists acknowledge that life on Earth developed in both stages of gradual progress of small adaptive changes followed by spurts of evolutional leaps that can only be explained as the result of and intelligent design. Quantum physicist Amit Goswami is his book ‘The visionary window’ believes that the quantum leaps in the development of species may be explained by quantum science. A number of quantum scientists have created the foundation for what they call quantum evolution. The basic idea of quantum evolution is that genes mutations take place in the quantum state and not in the classical state of Newtonian physics. Quantum super positions of gene mutations do not manifest immediately in the phenotype of the organisms but accumulate in the gene pool of the species over millions of years. Goswami mentions that morphic genetic fields could be the storage space for these quantum mutations that take place within the species. Quantum mutations allow for an endless number of possible gene combinations taking place at the same time. Only changes in the genome of a new life form that makes biologically more sense eventually collapse from the quantum state to the classical state. He mentions that consciousness must be involved to trigger the collapse of the quantum state before the new specie emerges. Quantum evolution could explain why transitional life forms were never found in the fossil records, since the transitional life forms only virtually existed in the quantum realm and came into existence in quantum leaps. After new species have come into existence, nature uses the natural selection process to select those genes that are available in the gene pool of the new specie that best fits the environment. However these adaptive changes of the specie to new environmental situations have always been available in the collective gene pool. So quantum evolution embraces Darwinism in the sense that it believes that the natural selection mechanism is a pressure that allows for species to adapt in the metastasis period in between quantum leaps of new species. Unlike Darwinism believing that there is no purpose in evolution, Goswami’s theory states that there is a discernable direction in evolution from simple to more complex life forms. He believes that the consciousness choice for the collapse of the quantum potential of genes to create new species is in accord with a greater plan. A fundamental question indeed is why did life on Earth develop from primitive single unconscious cellular life to complex human beings that eventually became self-aware? What could be the purpose of self-awareness if evolution is only about Darwin’s survival strategies of selfish genes? The new discoveries outlined in this book of an intelligent all pervasive cosmic energy that is omnipresent in the universe and that also serves as a recording medium for information such that it can act as the storage device for morphic genetic fields of DNA preserving the genetic information of species, seems to contradict Darwinism and lends credit for the Intelligent Design and quantum evolution theories. Also the physics of chaos theory seems to support the Intelligent Design theory of Michael Behe. The fractal attractors of chaos theory raise the philosophical question if there is purpose in the universe. Are we pulled towards a final goal? Is evolution a pulling process towards a finite end point somewhere in the future or are random mutations by chance in Darwinism still pushing us? Chaos theory seems to favor the first option. DNA’s purpose is not to serve solely as a chemical memory device for the reproduction of proteins. Russion research has revealed that we underestimated the intelligence of DNA as it acts like a Bio computer and is able to store and process biological information of the metabolisms that place in our body as well as genetic information. Most astonishing the codon sequences of DNA can be reprogrammed by coherent frequency sources such as modulated laser light, radio waves and human emotions. We have just started to discover the gateway functions of DNA to information fields, the bridge to what Rupert Sheldrake called the morphic genetic fields of life. Morphic genetic fields may be the true driving force behind biological evolution as opposed to the random mutations of the genes by chance and the natural selection process that was proposed by Darwin. These new discoveries show how little we still actually know about DNA. Not withstanding the fact that we apparently still have a very limited knowledge of DNA in the West that is accepted by mainstream science, we nevertheless took the liberty to start playing around and modify the genome of crops and organisms as we please. These enterprises could be very hazardous to the biosphere and the very survival of life on Earth since restructuring of the DNA molecule destroys the wave characteristics of the DNA that took nature millions of years to perfect. As long as we don’t speak the language of DNA, we should seize to rewrite the book of life, I think we’re lead astray and are on a dangerous road.